We’re back for the 2nd Annual Bourbon, BBQ, and Bluegrass Fundraiser to benefit the Johnston County Rugby Park project. 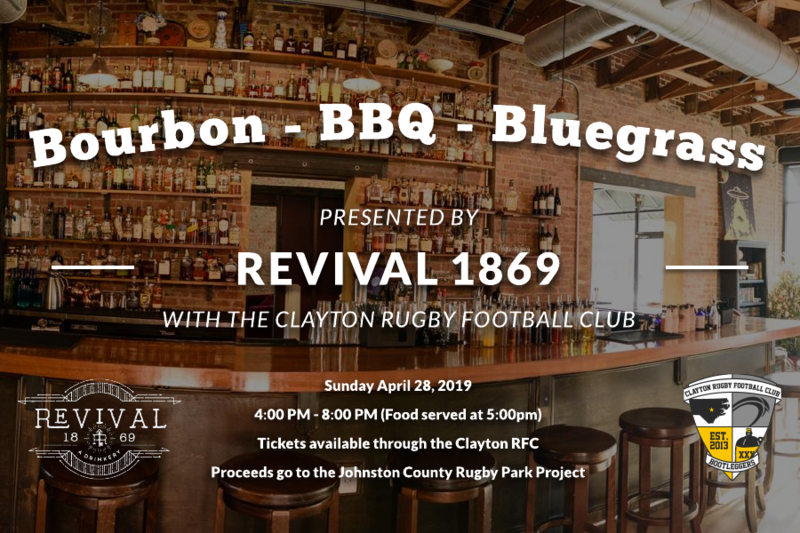 Join Revival 1869 and the Clayton Rugby Football Club on Sunday April 28, 2019 for an afternoon and evening of Bourbon, BBQ, and Bluegrass music. Experience some of the best BBQ in Johnston County along with Bourbon infused side dishes, Bourbon pairings and drink specials. Proceeds from the event go towards the Johnston County Rugby Park project. Tickets can be purchased online through the form below or in person via cash/check at Revival 1869 or through the Clayton RFC. Proceeds from the fundraiser go to the Johnston County Rugby Park project. The first public rugby-specific park in North Carolina! Includes BBQ Plate and side dishes. Doesn’t not come with a bourbon pairing. Includes BBQ Plate and two standard bourbon pairings. Includes BBQ Plate and two premium bourbon pairings.